Irene Marot is a professional actress turned artist. She completed her MA in Fine Art Painting at the University of Brighton in 2007. Her work focuses on the extraordinary held in the ordinary, giving attention to the apparent mundane whilst seeking transmutation. 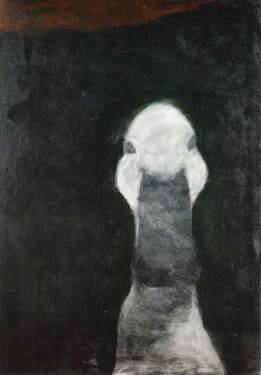 Living in a small farming village on the South Downs necessarily impacts her practice; recognising the strong connection to the animals that become a droll reminder of our ‘isness’, whilst tracking feelings and responses to the energetic source of the natural shapes around her – her paintings, conduits for metaphorical forms moving through space. ​Please feel free to contact me re: sales, exhibitions etc.